It’s that time again. The time when I help the teacher-trainees in our program get more comfortable with the concept of writing. One of the ways I do this is by doing a session on the benefits of combing a dictionary with a thesaurus (Lesson Planning Flow – Thesaurus Poetry; How Do You Create Smoother Transitions?). I’m often fascinated by the fact that many of my teacher-traineess have barely used a thesaurus. I thought maybe they weren’t alone, and that the email I just sent them could be of use to someone else out there. Tomorrow we’ll be writing our narratives. I thought this would be a great opportunity to introduce you to some online resources. As we get deeper into our writing practice, I’ll be introducing tools that I think are valuable to writers. There are two resources that all writers have by their side when writing: a dictionary and a thesaurus. As we talked about before, if you are interested in developing your vocabulary knowledge, it’s helpful to use English dictionaries that are specially developed for language learners. The one I recommended to you is http://www.ldoceonline.com. I also recommend using a thesaurus http://thesaurus.com/ with your dictionary. When you find a synonym in the thesaurus, but aren’t sure if the word is appropriate for the sentence you are writing, check the definition in the Longman online dictionary. The combination of the thesaurus and the English learner’s dictionary will help you catch the subtle differences between words that a Korean-English dictionary might not be able to do. When you are writing, I suggest keeping these websites open and available as a writing reference. Getting a round of applause at the end of a lesson is definitely a nice little pick-me-up for a teacher. I was fortunate to receive one these after having unveiled one of my favorite magical teaching tools from the ever giving tickle trunk called the world wide web. 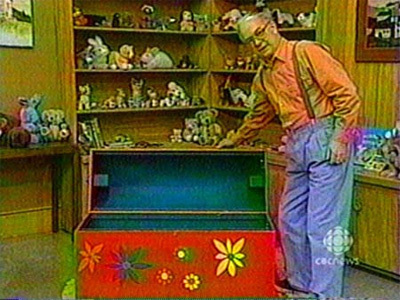 Mr. Dressup was my favorite childhood TV personality. He could find any magical item in his tickle trunk.